Families will find plenty of interesting activities in Reykjavík. Whether it’s splashing around in a thermal pool, trying on Viking armour or viewing some of the largest mammals on Earth at close range. There’s fun to be had for all ages in the city. Grown-ups will be happy to bring their families to Reykjavík, a safe and clean city with a compact centre that’s simple to navigate on foot and provides easy access to nature. Locals are also very open to youngsters; you’ll find a high chair in every café and see babies sleeping in their buggies outside on the sidewalk while their parents are inside. Reykjavík has numerous cultural, leisure and sporting facilities many of which have sections and activities specially designed for kids! Children’s Culture Festival (April), First Day of Summer (April), Festival of the Sea (June), Independence Day (June 17), and Reykjavík Culture Night (August). - Splash & play - at one of 18 thermal pools in the Reykjavík Capital Area. - Makes friends with the resident ducks, geese and swans - at Tjörnin Lake. - Experience our culture - at the Reykjavík City Museum. - Experience Viking times - at one of the capital area's many museums. - Talk to the animals - at the Reykjavík Family Park & Zoo. - Experience our family friendly library - at the Reykjavík City Library. - Get a guided art tour in English - at our art museums. - Try delicious Icelandic food - hot dogs, soft ice cream, skyr and liquorice. - Climb to the very top - of majestic Mount Esja. - Go horse riding - through pastoral valleys and rocky lava fields. - See whales - and puffins on a boat trip from the old harbour. - Watch bubbling hot springs - and roaring waterfalls on a day trip from Reykjavík. - Revel in a Reykjavík winter - be dazzled by the multi-coloured Christmas lights, visit the Hafnarfjörður Christmas Village, skate on Tjörnin Lake or start a snowball fight. 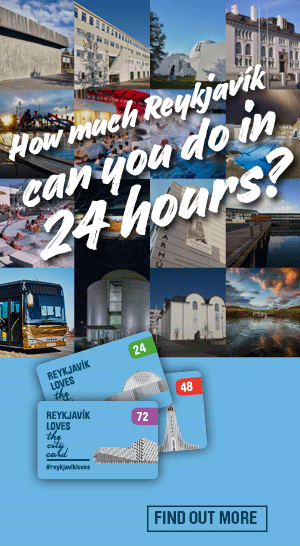 Whatever you do, don't do it without our fabulous money saving city card:The Reykjavík City Card! Reykjavík's Zoo is definitely not the biggest park, but it sure is cute. It features Iceland's farm animals, including horses, as well as the few wild mammals who inhabit this cold place in the North. For those who’d rather spend time in the company of Mother Nature, a trip to the remarkable solfatara fields of Krýsuvík will reward you with a memorable afternoon and an education in geology. The Nordic House an icon of aesthetics, is a cultural institution and an architectural gem situated in Vatsmýrin, only a 10-minute walk from the Reykjavík city center. Hallgrímskirkja church is Reykjavík's main landmark and its tower can be seen from almost everywhere in the city. Kolaportid is an ideal place to watch Icelanders in their natural habitat, and a great place to buy strange Icelandic delicasies. During the summer months, the west coast of Iceland becomes an excellent viewing platform for witnessing one of nature's most magnificent shows on Earth - the setting of the midnight sun. The colourful Old Reykjavík Harbour is fast becoming a new boom area of the city and a lively centre of activities and attractions. Check out the bustling birdlife at one of Reykjavík's most iconic landmarks. A little treasure in the heart of Reykjavík, where visitors can enjoy a relaxing but also adventurous quick getaway from city life. A striking addition to the Icelandic and European cultural scene! The Imagine Peace Tower is a work of art conceived by the legendary artist, musician and peace advocate Yoko Ono as a beacon of world peace. Look out for the remarkable Solfar Sun Voyager sculpture along Reykjavík's scenic waterfront.